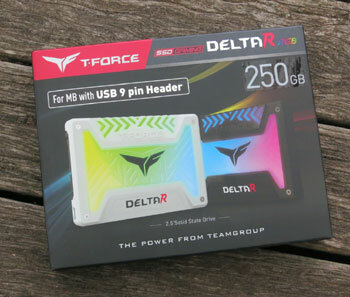 Today we're looking at the T-Force Delta R RGB SSD from Team Group. 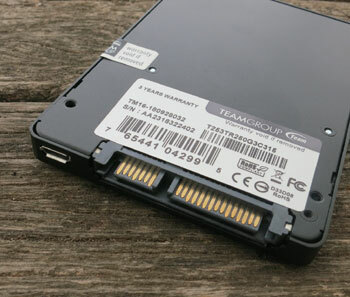 This is a 250GB SATA SSD, also available in 500GB and 1TB, with a white or black surround. What that surround is surrounding is a diffused LED panel which you can use to add to the lighting effects in your PC case. You may be wondering why you'd want your SSD to light up, but the current trend of RGB lighting has reached power cables and pretend memory sticks, so we shouldn't be too surprised that the nice wide upper surface of an SSD has been employed for this purpose now as well. 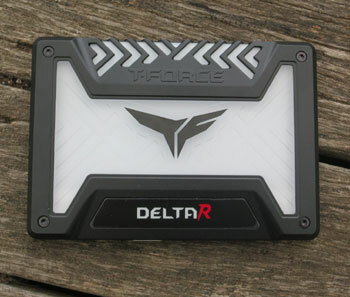 This SSD is in a family of Delta RGB SSDs from Team Group, with the main difference between the models being the RGB standard they support. There's a few competing ways of controlling LED lighting via the motherboard, which can either be 12V or 5V, so you have to pick the appropriate model for your motherboard. The model we're looking at is the R (Rainbow) version, which is not controllable by the motherboard but simply uses a USB header to power the LEDs, which cycle through a pattern of colours over which you have no direct control. This means it's compatible with any motherboard even if you don't have a newer one supporting an RGB standard. You can plug it into an external USB connector instead, or even a USB powerpack if you just want to wave it over your head at a rave. 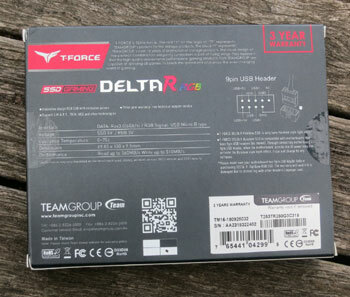 The SSD arrived in a small retail pack, very similar to ones we've seen from other manufacturers. 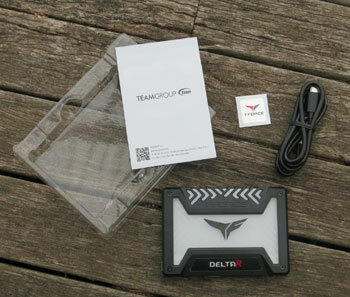 In the box we get the drive itself, a small instruction leaflet, a case badge and the connector cable. This cable connects a 9-pin internal USB header to standard Micro-USB. Remember that this cable only powers the LEDs and does not offer any control over them in this model. 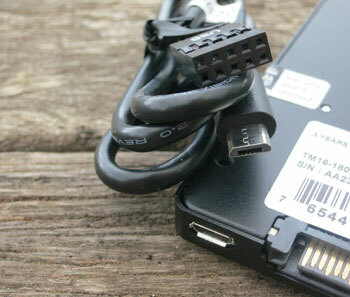 You could use any Micro-USB cable in its place, if you prefer to use an external USB port for example. Also, you have to provide your own SATA power and data cables to hook this drive up to your system. Installation was simple as you'd expect, on our ASUS Z97-A testbed in a generic tower case. It's worth noting that the RGB functionality doesn't make this drive a nonstandard size - it's 9.5mm high so should fit any standard 2.5" mounting. Some drives, such as the Crucial BX200 I reviewed a while ago, are only 7mm high but come with a 2.5mm spacer. However I imagine these RGB drives will generally be installed in a more open location in a case which lets them show off the lighting effects. The drive formatted under Windows 10 to 232GB. 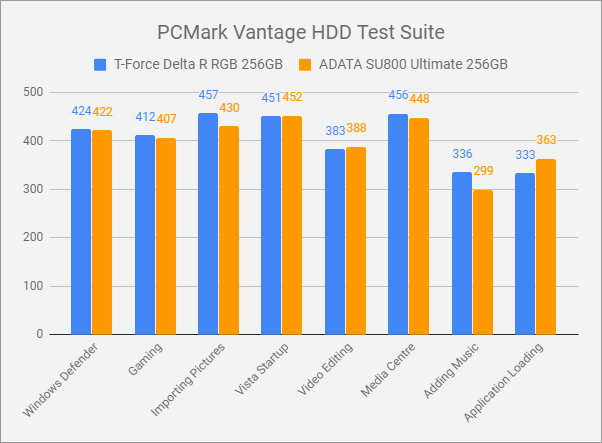 I ran some benchmarks to get a feel for the speed of the drive, comparing it to the most recent and fastest SATA SSD I've reviewed, the ADATA Ultimate SU800 in 256GB. That drive is around two years old so I'd expect the newer T-Force to hold its own against it. The numbers from AS SSD Benchmark are close to the numbers given on the box (about 93% for read and 88% for write). 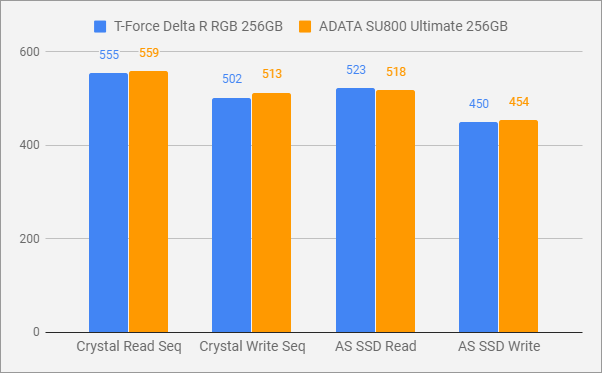 Regardless, we can see the T-Force and ADATA drives are almost identical in AS SSD and CrystalDiskMark sequential reading or writing, with an insignificant 1-2% difference. There's some variability across the results here but overall you'd have to give the edge to the T-Force drive, but only by a very small margin. Neither drive is being particularly outshone by the other here.